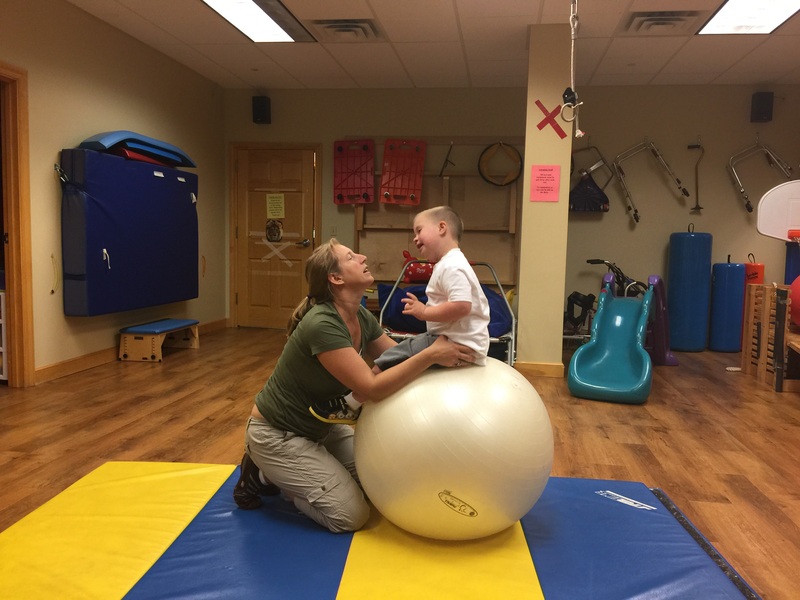 You may notice that Noah is sitting, rolling, stretching, and grabbing rubber exercise balls in the majority of his therapy sessions. Today he got to play on a giant, textured rubber peanut exercise ball. They come in a lot of sizes and a few different shapes. I am fairly certain we have tried them all. So,what’s the goal of using these exercise balls? The ball is probably most helpful for balance. By working on balance Noah is having to engage various muscles to sit on the ball. When he is on the floor, he can use fewer muscles and rely on stronger ones. This lets others like his obliques hide, which does not help those muscles out. Once on the ball, Noah has to rotate muscles in response to shifts in order to maintain his sitting position. 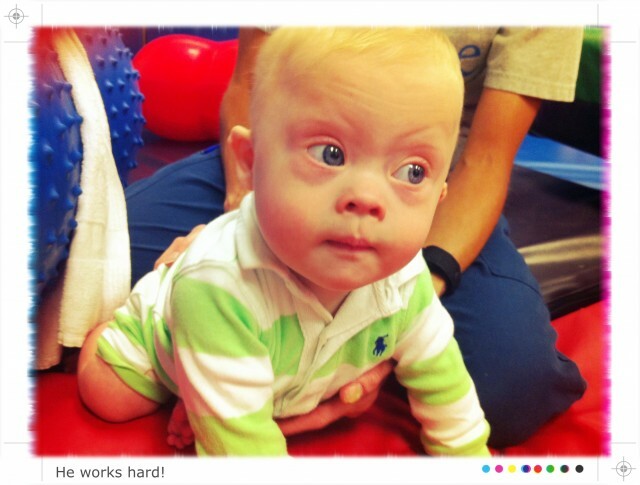 This helps with his postural response so that when he is on the floor he sits like a champ! "Working on your core is hard work!" Another good reason to use the ball is it helps Noah learn how to react. If he is slipping one direction, he has to correct himself. Noah does not have much of a protective response currently, which is common with hypotonia. The ball helps him learn that. A protective response is putting your hand out to catch yourself, or using the opposite muscles to maintain a position if you are falling. The therapists can cause those actions, which should provoke a protective response, easily and safely on the ball. He also uses the ball to do sit ups. You have seen how Noah’s abs are stronger than his mom’s. I have noticed that it is much easier for the therapists to target certain muscles when he is on the ball rather than on the floor. Those obliques are not ignored when they do sit ups with Noah on the ball. One last good reason to use the ball is that it is a good tool to prop your hands on while sitting. It allows Noah to roll back and forth and sit up straight. He loves the textures of the ball so it keeps him entertained. It also provides a higher surface for him to prop his hands on so that he sits up straighter and doesn’t do the dreaded bad habits. You can buy these rubber balls pretty cheap at your local Target, or online at Amazon. We have two. A large yoga balance ball, and a smaller rubber one. We have found them to be fun (and cheap) developmental tools to have around the house. Have you guys been using exercise balls in your therapy? What sorts of developmental toys do you, or your child’s therapist use? We do use a ball at ho me, but really only on our own. Nice to have some ideas on how to use it more fully. That’s awesome Leah, glad we could help! Let us know how they work for you. What sort of things have you been doing? what fun! Haha, I think I should get a exercise ball! I know! I always tell people that Noah works out much more than his dad! I am an OT and I love your blog! I often pass it on the parents and therapists in Egypt, where I currently work. How did you find our site? And we really appreciate you sharing it with parents. By the way, we’d love to get a link on your site as well. I just checked it out, and it looks great! Keep up the great work! I think I found your blog through another blog, but cannot recall which one! There are not many parent bloggers (actually, I do not know of any!) here in Egypt. So, I love sharing it with people. 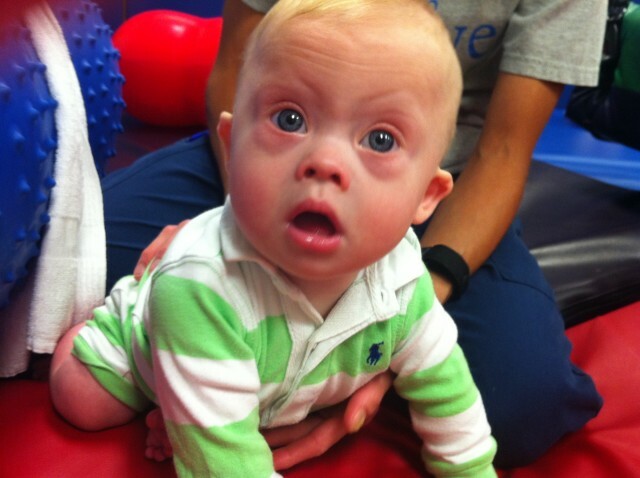 There is an Down Syndrome Therapy Egypt group on Facebook and one other group for parents of children with Down syndrome that I post information to. I have a website: http://www.childdevelopmentclub.org that I started because I wanted a place to share all the good links I come across! I also have a Facebook page: Child Development Club: Egypt that I share international and local child related articles and events. That’s so awesome! Thanks for commenting, we’re looking forward to getting to know you! We have a friend that lives and works in Cairo at one of the elementary schools. Are you anywhere close to Cairo? AWESOME!! I am a music therapist, and currently have 5 children with DS, all under 3 years old. The therapy ball is the best invention yet, for stability. Can’t wait to tell my parents about your websites, if they aren’t aware of it already. 🙂 Thanks for this bright light. YOU are awesome! Thanks so much for the kind words, we really appreciate it. We have lots of great articles on our site that you may find useful. My wife is a pediatrician and has written some excellent posts. So awesome! So glad to have you along! We LOVE the peanut for my almost 8-month old daughter. I like that I can place her either on top of it or on her belly. We dangle all sorts of toys in front of her that have visual and auditory goodies on them to keep her going…as well as what we discovered at her last PT/OT session are her new faves–Mardis Gras beads! Hi I love your blog, Noahs a cuty pie. I wanted to know which excercise ball works best and which size to go with . Anyway, I’m going to break out our ball and sit him up on it. He’s got some strong leg muscles and hands, but that good ol’ core, well he tends to be a tad bit lazy. I didn’t see how old Noah is in this video…I’m guessing 9 months? Is that right? I care for my 11 month old granddaughter who has hypotonia. We have her sit on the exercise ball for therapy. Her PT forgot to tell us about the ball, and I saw it on your blog! Thank you so much for posting it. It seems to really be helping her. I passed this along to our new PT so she can see what kind of info is out there for parents. We have 2 therapy balls, a weighted ball, jogging trampolines, one with handles…and a “rollercoaster”. That’s awesome. How long have you guys been going to pt? Thank you soooo much for your site. I have 14 month identical twins who were 6 weeks early. One is a little delayed in a few things (fine motor skills, posture and movement). He doesn’t have great core strength. The PDs all say wait and see. They are not concerned. As such I have not been able to get any information on how to help him until I came across your site today. Since he still doesn’t have a pincer grasp I was googling (without much luck) how I could improve this. Your blog is exactly what I was looking for and much more.